I was very proud to drop off 80 thank you plaques to CONCERN for living in Amittyville. They will be handed out to the Veterans that live there on Veteran’s day. I personally want to thank all the veterans out there for giving me the life that I have. There really is no greater sacrifice and it is truly appreciated. 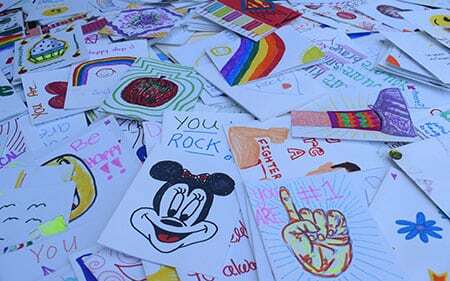 Thanks to Driftwood Day Camp for helping me to donate close to 300 cards to Hospitalized Children. It filled my heart to see how eager the staff was to create these cards. I always knew we had a special staff but now everyone can know. created these beautiful plaques so that our veterans can be reminded everyday that they are appreciated. I want to make a huge shout out to all of the wonderful teachers, parents and librarians that I had the pleasure of meeting in the past 2 weeks during the Arts in Education Showcase and the Performer’s Showcase. It was a great opportunity to speak directly with my clients and see what people are looking for. I got some wonderful feedback on my new programs and some great ideas for some future programs. As the saying goes, it is back to the drawing board for me. Luckily that is my favorite place to be. I am looking forward to working with all of my new contacts! It has been a wonderful school year and I am excited for camp and the beach! I would like to thank all of the schools and the art teachers that were so gracious to share their classrooms and students with me. I was thrilled with all of the murals and I just love my day at Mandalay Elementary School where all the students get so creative with recycled materials. A special thank you to my hometown elementary school, Judy Jacobs Parkway. It was an honor to help create a mural in the same school that my children graduated from. To all the wonderful art teachers that helped me this year (Danielle Herman from Charles Campagne, Beth Brody from Centre Ave, and Lauren Moran from Glenwood Landing)..THANK YOU!!! I am so excited to see all of the kids at Driftwood Day Camp and many of my favorite libraries this summer. Be safe, get outside and and create! Welcome to my new website! Spring is a time for change and I am starting with my website. Green Earth Craft has made a lot of changes in the past 2 years and it is time that my website reflects those changes. Although I think about our environment all year, April is the time of year where those thoughts are most popular. This Earth Day think of 1 simple way to help the environment. I am gathering all of the clothes that I have not worn in over a year and donating it to charity. I figure that if I have managed to go a whole year without it, then I really do not need it. The 1 exception is my dad’s old sweater. I may never wear it, but it reminds me of home. Think of 1 thing you can do and let me know. I would love to add another thing to my to do list! So here is 1 of my New Year’s resolutions….add at least 1 new craft every month. I am happy to say that the library programs are going well, but I fear that I have neglected the website…well no more! My creative juices are flowing and I intend to share it all with you. So get out your scissors and glue sticks and let’s think green and get crafty. I am passionate about the power of art. Art can be used to comfort, heal and help. I teach a variety of art classes using re-purposed materials to both children and adults. Through art I am able to help others discover their own creativity while helping our planet. Through my community service programs I am able to use creativity to help many causes that I am believe in. Join me in discovering your creative side and the creative side of your children while spreading some love. Copyright © 2017 Green Earth Craft, Inc.